Canadians may have a reputation for being polite but I always thot that included a good dose of mythology. I have noticed some not-so-polite things done by Canadians. Two stories caught my attention that might shed light on the subject. A while back there was a short public debate on whether our national symbol should be changed from a homely beaver to a stunning polar bear. Of course I jumped in with both paws in support of the obvious choice. I was stunned to find fellow bloggers and friends siding with the toothy tree cutter. Many other Canadians shared that view and the issue quietly slid away like a beaver in water. Looking back on the discussion, I may have missed a critical part of what people were saying. When they claimed to support the industrious nature of the beaver and other honourable characteristics, it may have been because they were shying away from the symbolism of a ferocious and powerful predator – even if cubs look cute on a Christmas card. In short, they were being polite. More recently, Canadian Geographic noted that Canada didn’t have an official bird. They graciously offered their website for people to make their case for various birds and vote. The results will be forwarded to the Canadian government. Great idea. The odd thing was that when you went to vote, they asked for some identifying information including whether you lived in Canada or United States. Well that tickled my funny bone! What other country in the world would ask their neighbour’s opinion on their national bird? Hilarious! Maybe Canadians really are polite! In keeping with the spirit of this post, I have politely offered two candidates for Canada’s official bird – snowy owl and common loon. What do you suggest? Of course it doesn’t matter where you live! Now if only a snowy owl could practice and make the sound of a loon, then it would be the perfect choice! Always good to hear from fellow Canadians – especially polite ones who enjoy my posts. Thanks for stopping by. The reason the magazine asked for nationality was so that they could discount my opinion and that of my fellow Americans! Hahaha! Or maybe they wanted to make sure that any bird chosen was OK with the Americans:) Polite remember! I guess, being a visual creature, I’m going to go with the owl. But my opinion shouldn’t matter at all, haha! But here’s the thing – I care what you think!! Since I like them both, I am happy to declare you are in polite company. Both birds look great. But, as you wrote above, if only the snowy owl could make the sound of a loon, that would be the best choice. I wonder if I could teach it? Thanks so much. It was fun to be there and capture those moments. I agree with your owl caption, it’s gotta be a snowy that can make a loon sound. There’s your winner! I’m sure with a lot of practice, anything is possible. That would be quite something. I love the loon, but the word gives other connotations, so my vote is on the owl. After all, we have that fish stealing thief of an eagle. So no problems in the predatory nature of the owl. I am glad we did not get the turkey as as our symbol. Another word with connotation. Beautiful images of both birds in your post. I finally saw two critters we don’t have in NY here in Hawaii, but still nothing that can eat me. I think lots of birds might have connotations even if they aren’t as obvious as the loon. I suppose it’s like baby names – a person gets used to just about anything after a while. I’m no expert on Hawaii but I think you might have to go in the water to find creatures that can eat you! By the way, I feel honoured that you are in Hawaii and commenting on my blog. That’s funny. Given that our one dollar coin already sports the loon and is referred to as the loonie – I think we already did in a way! I would suggest Macaroni penguin! Because I can! If you Canadians want a bird that actually exists in Canada, then the loon certainly looks more polite, and the ‘common’ part of its name is a bit more humble, perhaps? Incredibly beautiful birds, both of them! You certainly can suggest the macaroni penguin – I like it. The only trouble is I don’t have photos of it and wish I did. A day and a night bird is an interesting idea – a person could open this up and collect all the creatures we like to represent something. You are certainly correct about magical powers – the loon and the snowy owl cast quite the spell on me. As for the polar bears, they are amazingly resilient, so I am still hopeful. I appreciate that. It’s a remarkable bird. Definitely the snowy owl. The common loon is the state bird of Minnesota, and though all Minnesotans are inherently at least as polite as Canadians, I wonder if that politeness would extend to sharing their feathered flagship symbol. Canada, on the other hand, has even more snow than Minnesota, so the owl is the obvious choice. Your logic seems sound to me! The true test of politeness might just be sharing a symbol, perhaps a step too far. Great shots Lyle. Good job getting down low on the Loon. Both of these are on my bucket list. None around my neck of the woods near the Gulf of Mexico. When special birds are relatively common, it’s easy for me to forget others haven’t seen them. Then again, I wish I could see some of birds you capture. By the way, your amazing low angle shots have inspired me to get lower and this time it actually worked. Two beautiful shots as always, Lyle, particularly that of the snowy owl. That’s funny! An excellent choice. If shunning predators makes a person polite, then I guess I’m not! There’s something special about them. Your spectacular shots of both birds make this a tough choice, but I think I would go with the loon. I love its pattern and coloration and I hope someday to hear its famous call. I wish I could help you do that! Excellent reasons for the choice. The Loon makes me think of wilder, northern places. My uncle was a cigar smoker, and smoked “White Owls”. I can’t look at a photo of a snowy owl without thinking of him, or cigars! He did love Canada though, and his ashes are buried up on PEI. It’s interesting how powerful image memories can be and how long they can last. My favourite loon memory came after a long day of paddling through some pretty rough water after a weekend of camping. As the sun was setting, we paddled into the last set of lakes with the water like a sheet of glass. With the sky turning red, we were serenaded by loon calls from both sides of the lake. Absolutely pristine! Now that is a beautiful memory! I can picture that scene from your words. I am forever hearing about the Loon (and seeing pics too) so I might suggest the Loon is an obvious choice. (as an opinion from this Aussie down under). By the way, that’s a stunning photo at the beginning of this post. Glad you enjoyed the loon photo. Always happy to get Aussie opinions. It’s too we are all telling you about the loon without you getting to see and hear it. That would be a difficult decision for me. I LOVE the loons. It was our state bird in Minnesota and the call of the loon brings me back there. On the other hand, I LOVE the snowy owl. In fact, I like all owls. So this would be a draw for me. It is a tough choice. They are both wonderful wild creatures with distinctive beauty and sounds. I love them both too. Wouldn’t it be something to get a photo of both in the same photo? Gosh tough call from down south here, although terrific photos of both potentials. I thought perhaps the Snowy Owl was more ‘all yours’ than the stately Loon, but I see both dip down into the States. I still think the Snowy Owl – I just associate the Loon with Maine in mah head. Yes the birds tend to ignore the artificial human borders – we may have to set up an international inquiry about that!! It’s interesting how memories of certain creatures affect our reactions to them. Glad you enjoyed the photos of both. 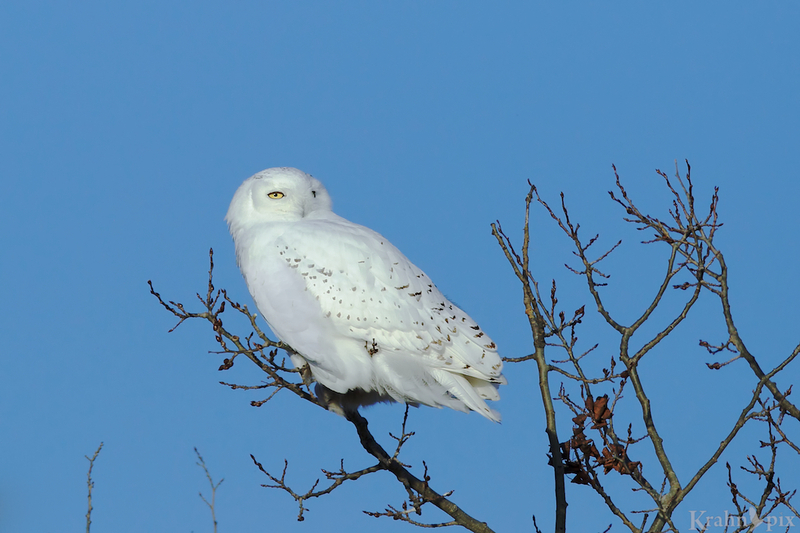 Your education has me loving the call of the loon, but that Snowy Owl is spectacular. Australia’s national bird is the Emu – and it can’t even fly! The loon and the snowy owl are two very special birds for me. I never see them enough. Your Emu comment is funny. Full Disclosure: I’m American. I think you need to go with the Snowy Owl. Ben Franklin wanted the humble turkey for our national bird, we instead chose the scavenging bald eagle. I think you should also have a predator so we don’t look like jerks compared to you. I find it fascinating that people’s choices of national birds tend to focus on either how they look or what they do. My bias happens to be for the former which typically puts the predators in play. The other side of your humorous comment is an amusing response I got on Facebook where someone said we shouldn’t have a bird that eats by other national birds! I expected you would judge them on the cute factor! What an extremely sharp picture! Taken at what actual distance? If you are talking about the snowy owl, I was about 40 metres away. 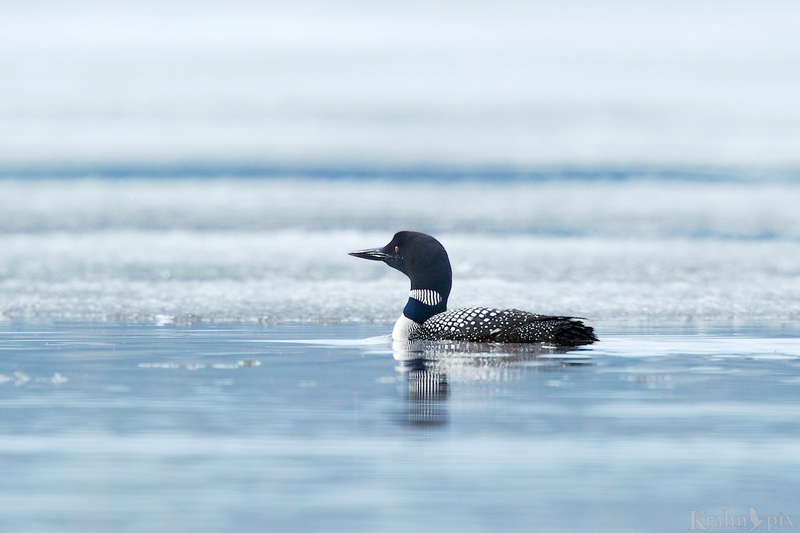 AS much as I like the Snowy Owl, to me a loon speaks of the north more than any other bird. The sound of a loon carrying over the waters in a wilderness just says wild to me. That haunting call certainly says wild to me too. It’s amazing how far that sound carries on a quiet evening and it always has the same wonderful effect on me. Hard choice here. The loon is indeed regal and classy, but then would folks start thinking of Canadians as loony? Perhaps I’m leaning toward the Snowy. It’s so white and fluffy and cuddly looking. That might do for my thinking on Canadians. That’s coming from your neighbor down south here. I’m not sure if you are aware that our one dollar coin has a loon on it and is always called a loonie – so we may have already passed that bridge! Your descriptions of both birds are spot on. Always good to hear from one of my favourite southern neighbours. It seems a long time since I’ve seen any Canadian coins down here (must have something to do with the exchange rate perhaps), much less a dollar coin. Having a loon on a coin is marvelous. Far, far better than a bunch of dead presidents or other not so pretty people. I agree whole heartedly with that! They are both spectacular but I would opt for the loon, mainly because I have had more contact with them and they are spectacularly unique and beautiful. That’s some good reasoning. My goodness, you have certainly see different kinds of birds when you move that far away! You mean that we shouldn’t vote for the CANADA Goose? Ha. You can happily vote for it. I think perhaps my familiarity has reduced my fondness – their honks are wonderful indications of fall and quite beautiful in the distance but rather annoying in closer quarters. Illegally crossing the border sounds like a fascinating story. I’ve never heard of anyone going to those lengths to see a loon! Regal and classy is a great description.